New BMW CCA Club Racing Enduro Series! Click here or below for our 2013 schedule! 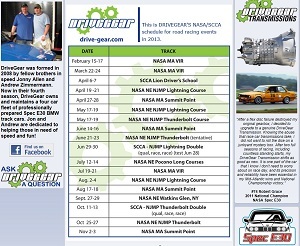 Check out the schedule page to see all the events DriveGear is planning to attend in 2012. 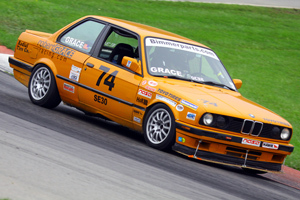 Reserve your Spec E30 racecar rental today! We now have an email list to keep you up to date with news, offerings, and specials! Rental Deal for Nov 5-6 @ SP: Free Coaching! 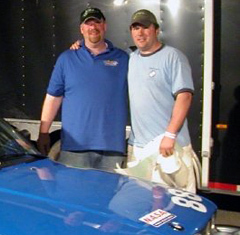 DriveGear Racing has teamed up with Spec E30 national champion Robert Grace to offer an amazing deal for the NASA Mid-Atlantic Fall Finale at Summit Point on Nov 5-6. Rent one of our Spec E30s for the weekend and for no additional cost you will get one on one personal driver coaching from the National Champ! This is an excellent opportunity to learn and get better for HPDE students, time trialers, or racers. Space is very limited so don’t wait! Please contact us ASAP to reserve your seat.